MySQL Enterprise Edition includes the most comprehensive set of advanced features, management tools and technical support to achieve the highest levels of MySQL scalability, security, reliability, and uptime. It reduces the risk, cost, and complexity in developing, deploying, and managing business-critical MySQL applications. Oracle MySQL Cloud Service is built on MySQL Enterprise Edition and powered by Oracle Cloud, providing an enterprise-grade MySQL database service. It delivers the best in class management tools, self service provisioning, elastic scalability and multi-layer security. MySQL Document Store gives users maximum flexibility developing SQL and NoSQL, schema-free document database applications. 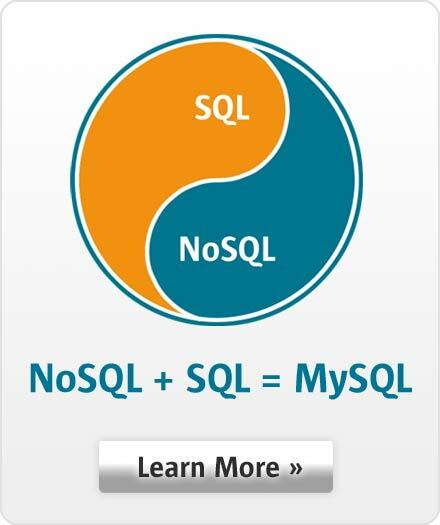 This eliminates the need for a separate database for NoSQL data. MySQL Enterprise Transparent Data Encryption (TDE) enables data-at-rest encryption by encrypting the physical files of the database. Data is encrypted automatically, in real time, prior to writing to storage and decrypted when read from storage. MySQL Enterprise Masking and De-identification provides an easy to use, built-in database solution to help organizations protect sensitive data from unauthorized uses by hiding and replacing real values with substitutes. MySQL Enterprise Backup reduces the risk of data loss by delivering online "Hot" backups of your databases. It supports full, incremental and partial backups, Point-in-Time Recovery and backup compression. MySQL InnoDB Cluster delivers an integrated, native, HA solution for your databases. It tightly integrates MySQL Server with Group Replication, MySQL Router, and MySQL Shell, so you don’t have to rely on external tools, scripts or other components. MySQL Enterprise Scalability enables you to meet the sustained performance and scalability requirements of ever increasing user, query and data loads. MySQL Thread Pool provides an efficient, thread-handling model designed to reduce overhead in managing client connections, and statement execution threads. MySQL Enterprise Authentication provides ready to use external authentication modules to easily integrate MySQL with existing security infrastructures including PAM and Windows Active Directory. MySQL users can be authenticated using Pluggable Authentication Modules ("PAM") or native Windows OS services. MySQL Enterprise Encryption provides encryption, key generation, digital signatures and other cryptographic features to help organizations protect confidential data and comply with regulatory requirements. MySQL Enterprise Firewall guards against cyber security threats by providing real-time protection against database specific attacks, such as an SQL Injection. MySQL Enterprise Firewall monitors for database threats, automatically creates a whitelist of approved SQL statements and blocks unauthorized database activity. MySQL Enterprise Audit enables you to quickly and seamlessly add policy-based auditing compliance to new and existing applications. You can dynamically enable user level activity logging, implement activity-based policies, manage audit log files and integrate MySQL auditing with Oracle and third-party solutions. The MySQL Enterprise Monitor and the MySQL Query Analyzer continuously monitor your databases and alerts you to potential problems before they impact your system. It's like having a "Virtual DBA Assistant" at your side to recommend best practices to eliminate security vulnerabilities, improve replication, optimize performance and more. As a result, the productivity of your developers, DBAs and System Administrators is improved significantly. The Oracle Enterprise Manager for MySQL provides real-time monitoring and delivers comprehensive performance, availability and configuration information for your MySQL databases. MySQL Router is lightweight middleware that provides transparent routing between your application and any backend MySQL Servers. It can be used for a wide variety of use cases, such as providing high availability and scalability by effectively routing database traffic to appropriate backend MySQL Servers. MySQL Workbench is a unified visual tool for database architects, developers, and DBAs. It provides data modeling, SQL development, database migration and comprehensive administration tools for server configuration, user administration, and much more. MySQL Technical Support Services provide 24x7 direct access to our expert MySQL Support engineers who are ready to assist you in the development, deployment, and management of MySQL applications.